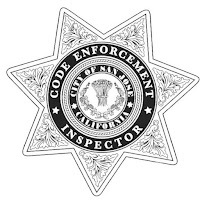 Code Enforcement is a division of the Department of Planning, Building and Code Enforcement. We utilize education and enforcement tools to facilitate compliance with Municipal Codes designed to maintain a healthy, safe and clean environment, carry out land use policy, and preserve the quality of life standards that residents and businesses enjoy in our community. Effective November 24, 2014 and continuing through March 2015, Code Enforcement will NOT take any complaints for early set out of yard waste. Seasonal weather often generates more yard waste. Residents are encouraged to regularly sweep leaves and branches to keep the storm drains clear. Building Code violations (building, plumbing, electrical, mechanical, etc. ), including construction or change of occupancy without permits. Inoperable or abandoned vehicles on private property. Illegal dumping of garbage on private property. Parking violations on unimproved surfaces. Unimproved surfaces can include but are not limited to: lawn dirt, gravel and plywood.